56 pages | 28 Color Illus. This report summarises the results of a research project commissioned by BRE Trust to apply a methodology developed to calculate the cost of poor housing in England to the housing of London. 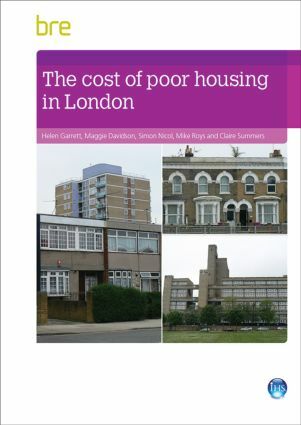 A full description of the original methodology is contained in 'The real cost of poor housing'. The results of this research show that there is proportionately slightly less poor housing in London than in the rest of England. This is largely due to the fact that London has a much higher proportion of homes that are purpose-built flats than the rest of England and such dwellings tend to be newer, more energy efficient and in better repair than other types of home. However, housing conditions vary considerably both between and within boroughs and there are parts of London where housing conditions are significantly worse than both the national and London average. Overall, there is a high (and previously unreported) proportion of health and safety hazards in the housing of London. While great strides have been made in improving the energy efficiency of the housing stock, an unacceptable number of households are likely to experience fuel poverty and overcrowding, as a result of the increasingly high housing costs in London. If works are targeted to reduce the worst health and safety hazards in these poor homes to an acceptable level, it is estimated that there will be a benefit to the National Health Service (NHS) of some £56 million per year. This figure could rise to over £140 million if we include other costs related to living in poor housing, including lack of educational attainment, lost work days, additional cost to the emergency and social services, additional energy and insurance costs. Providing more affordable housing and dealing with fuel poverty will save even more!